One of the many brilliant abilities that smartphones and tablet computers offer is the possibility to run and manage websites and blogs from anywhere – and lots of different ways to get it done. In many cases, a mobile web browser will take you far. 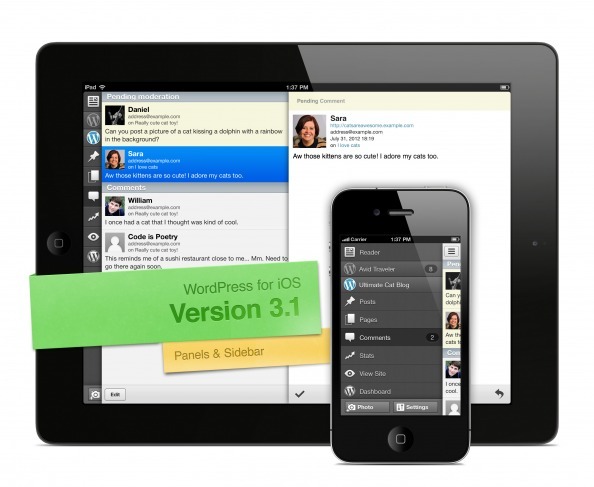 But for WordPress bloggers and webmasters who use iOS devices (such as the Apple iPhone or iPad), there is also an app called WordPress for iOS (available from the App Store) which makes it really comfortable to manage WordPress blogs and sites. A few days ago, version 3.1 of the app was released, redesigned and with with lots of improvements and new features. Beside a significant update to the user interface, the app now supports post formats and easier site and dashboard access that makes it possible to manage widgets and plugins. The iPad version has a new post preview feature, and the landscape mode has been improved. There is also a new sidebar navigation, similar to the kind that is used in the official Facebook and Twitter apps. I’ll try out the new version on both my phone and my iPad, and follow up on this post with a review of the app with screenshots and my opinion in a few days. I’m about to send my ex boss your URL. I’m pushing John Donati to learn web design. I’ve spent 15 years learning the web site design programs, & computer programming. So via this app I can admin my WP site, right?